With thoughts pressing ahead to the end of May and the whole business of UK Games Expo, I have been busy preparing the papery versions of my three main supplements at the moment. Consult Appendix Z, both CAZ No 1 and CAZ No 2, and The Blessing of St Agnes will all be available in physical saddle-stapled format, with glossy covers. In the case of St Agnes, the book has a weathered green leather cover-look. I admit that this comes as one of the standards for a basic bit of Lulu self-publishing, but to my mind it fits the adventure setting for some reason. The second Consult Appendix Z volume, Another Bug Hunt, already has a great cover image from Nicholas Cloister’s Monsters By Email. Nicholas does some truly incredible work and you can subscribe to his Monsters scheme that makes some of the images you receive available for personal usage and others available for wider distribution, like this one. The first Consult Appendix Z volume, Interstellar Travel Events, felt a little bit like a poor cousin. 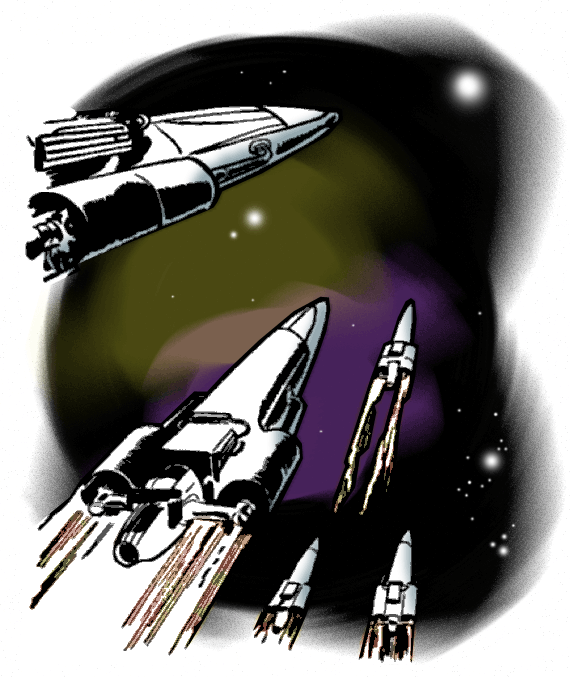 I used a public domain image from a classic science fiction magazine, black and white, but just what I wanted. I can’t claim to have corrected the balance significantly, but I have engaged in some basic colour retouching to make the picture less monochrome. I have gone for a bit of a nebula thing and add hints of colour to the shadows and drive streams. Like I say, nothing exactly awe-inspiring, but the end result comes across as slightly less intense than the original. I now have a box of these print goodies ready to roll – and I hope to drum up some custom at the event and retain the rest for customers keen to acquire physical copies later. Indeed, if you want any of these now – get in touch with me and we can sort something out in terms of cost, postage and so forth.